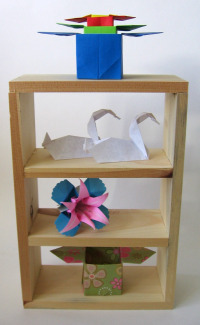 All About Origami has partnered with a specialty wood products company to produce display units made to our specifications, specially designed to showcase origami models. Take advantage of these introductory specials! The display units are handcrafted by Samsel Ltd of Wisconsin, USA, from sustainably-managed, green-certified Eastern White Pine and/or Norway Pine grown in Wisconsin. Your satisfaction is guaranteed. If you are dissatisfied with your purchase for any reason, please call 800-699-3793 within 14 days of receiving your order to arrange a return for exchange or refund. If the return is the result of a manufacturing defect, your shipping costs will also be refunded. More sizes and configurations are in the works. Please contact us if there's a particular size you'd like. Samsel Ltd is a small family-owned business in Central Wisconsin that produces specialty wood products. The Samsels create their products literally from scratch! From planting the tree seedlings, to log and sawmill, to kiln-drying, milling, and construction. Fascinating! Samsel Ltd is a veteran-owned company. They thank you for your support. This simple wood representation of Noah's Ark is the perfect thing for displaying origami animals or any small collections. There's plenty of room for lots of animals and their provisions. Made of ½-inch solid Eastern White Pine and/or Norway Pine to the proportions specified in The Bible. Comes fully assembled with attached hook for wall hanging, or can stand freely. Pairs beautifully with origami papers in its natural unfinished state. Or add your own finish. Each unit is one-of-a-kind with unique shading variations and the occasional small knot. 24" wide x 15¼" tall X 3½" deep. The models shown are not included. Ordering is easy: Please call Samsel Ltd directly at 800-699-3793, 8am-5pm CDT daily. MasterCard, Visa, and Discover accepted. Shipping: Unless you request expedited shipping, we will calculate the least expensive shipping method for you and add the amount to your order. You are welcome to call for shipping costs before placing your order. Actually, it's four shelves, if you count the top. Made of ½-inch solid Eastern White Pine and/or Norway Pine. 8" wide x 12" tall x 3½" deep. Openings are 7" wide x 3½" high. 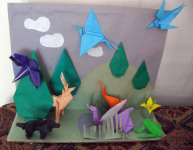 Create your own origami world on this sturdy base. 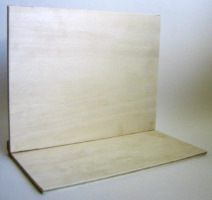 Made of high-quality ¼" plywood with a back support of solid pine. Back is 11" wide x 8½" tall. Base is 11" wide x 5" deep. In this example, we glued construction paper to the base to make the background. Comes fully assembled. The models shown in the example are not included.